The New York Wheel project has been delayed indefinitely after the developer fired the contractor and designer of the massive project. 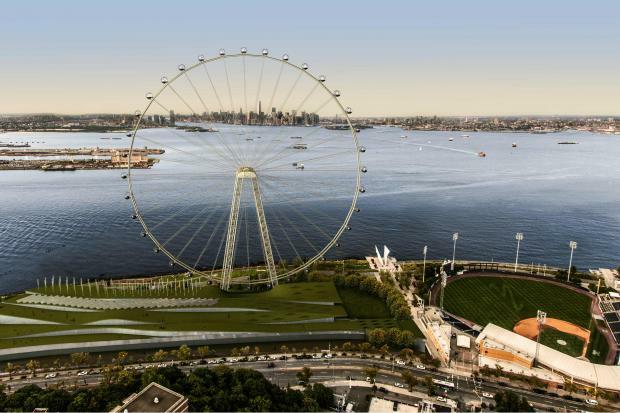 ST. GEORGE — Plans to build the tallest Ferris wheel in the country on Staten Island's waterfront have been put on hold after the developer fired the contractor building the 630-foot-tall observation wheel. The developer of the New York Wheel canned contractor Mammoet-Starnet on the $590 million project, indefinitely delaying the attraction's opening, according to court documents filed Wednesday. The two sides have been in a legal battle over delays on the project. "Due to the inability of Mammoet-Starneth LLC ('Mammoet'), the design-build team for the Wheel, to meet multiple design and construction deadlines, the developer has come to the conclusion that the best path forward for this project is to seek other means to take on the remaining aspects of that 'turnkey' arrangement," said NY Wheel spokeswoman Cristyne Nicholas in a statement. "The developer is currently exploring all available options for completing the Wheel and hopes that Mammoet will cooperate with it to facilitate this transition and ensure the prompt, diligent, and safe completion of The New York Wheel." The developer added that work would still continue on the St. George construction site, but that the move would delay fabrication work being done off-premises. The firing were first reported by the Staten Island Advance. The turmoil started after Mammoet threatened to leave the project because it claimed the developers failed to pay $20 million for "delay damages," according to court documents. The Wheel's developers filed suit against the contractor last month to keep them on, claiming it was responsible for the delays, kept jacking the price up and only threatened to leave to get more money. In a letter filed Wednesday, lawyers for Mammoet disputed the developer's account of the construction issues, saying the firm wasn't the cause of them. "NYW cannot readily extradite itself from its numerous defaults and pin the blame on the failure of the project to date on [Mammoet]," the letter reads. Despite claiming in earlier court documents that Mammoet would be the only one able to finish the project, the developer said it's now looking for others to get it across the finish line. Crews have been working on the Ferris wheel for nearly two years and have completed a large amount of work at the site. The developer already opened a 820-space parking garage, laid down the concrete foundation for the Wheel's legs, installed four, 90-ton pedestals to hold the the legs in December, and installed a 460-foot-tall crane in March to put the pieces of the Wheel in place. The 2,200 ton legs of the Wheel arrived from Italy in September and have been waiting at the South Brooklyn Marine Terminal to be installed in St. George. The Wheel — which took over a former parking garage for the St. George Ferry Terminal — was originally expected to be open in April 2018 and was considered to spark a resurgence in the borough's North Shore.